The only really detailed gunsmithing and repair manual on these extraordinary rifles ever published. 100's of crystal clear photos and illustrations. Click here for a sample page from the book. Expanded, two-in-one, edition - 383 pages with thread stitched binding and plastic laminated soft cover. $46.95 U.S. See order form for domestic shipping options. Numerical data including critical max.-min. parts dimensions, clearances, etc. FM-23-5 (Rifle Caliber .30, M1); TM9-1005-222-12 (Operator & Organizational Maintenance Manual, Including Repair Parts & Special Tools Lists - Rifle Cal. .30, M1, M1C, M1D); TM9-1005-222-35 (Direct Support, General Support, & Depot Maintenance Manual, Including Repair Parts & Special Tools Lists - Rifle Cal. .30, M1, M1C, & M1D); TM9-1275 (Ordnance Maintenance - Rifle, .30 M1, etc. ); TM9-2023-1 & TO11W3-5-3-102 (Field Maintenance - Rifle Cal. .30, M1, etc. ); FM 23-8, May 1965 (Rifle, 7.62mm, M14 & M14E2 Mechanical Training - Also applies to commercial M14, M1A, & M14A); TM9-1005-223-10 (Operator's Manual for Rifle, 7.62mm, M14, etc. ); TM9-1005-223-12 (Operator & Organizational Maintenance Manual, Rifle, 7.62mm, M14, etc. 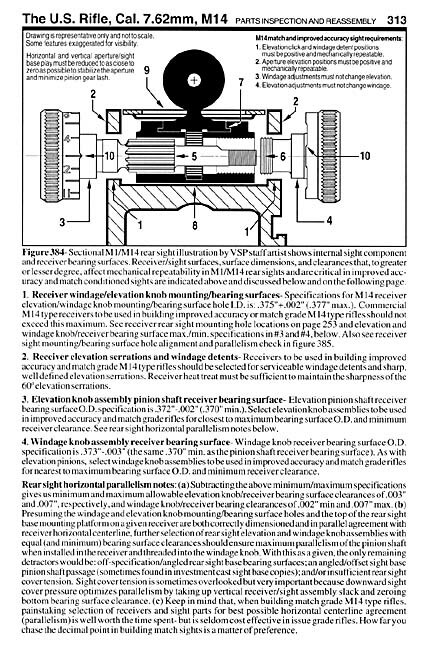 ); TM-9-1005-223-20 (Organizational Maintenance Manual, Including Repair Parts & Special Tools List - for Rifle, 7.62mmm, M14, etc. ), TM9-1005-223-34 (Field Maintenance Manual - Rifle, 7.62mm, M14, etc. ); TM9-1005-223-35 (Direct Support, General Support, and Depot Maintenance Manual, Including Repair Parts & Special Tools Lists - Rifle, 7.62mm, M14, etc. ); DWMR 9-1005-223 (Overhaul of Rifle, 7.62mm, M14, etc. ); Portions of ORDP-608-R-SA1 (Quality Assurance Training Pamphlet - Rifle, 7.62mm, M14); TI-02648A-25/10B (U.S.M.C. Technical Instruction - Match Condition Procedures - Rifle, 7.62mm, M14); U.S. Army Marksmanship Unit Pamphlet "Accurized National Match M14 Rifle"; National Match Rifles, Camp Perry, Ohio (NM Rifles Cal. .30, M1, & 7.62mm, M14); the various National Guard Marksmanship Training (MTU) Pamphlets, all other versions of the foregoing, and other publications.